The new financial year is in full swing and now is the perfect opportunity for review and to implement change that will make a positive impact on your practice. If your plans included saving time, growing your revenue and making more profit then read on to gain the framework from which to streamline your practice. Streamlining your bookkeeping practice with automation tools to take care of bookkeeping tasks is both exciting and daunting. You understand it is the right thing to do. You want to work smarter. You know you need to transform your practice. Getting started can be challenging. Here is a guide to help you tackle head on the challenge of how to start the transformation of your practice. The key steps you need to guide you through the process. It will challenge you to stop overthinking and start acting. Delivering the best possible growth for your practice this new financial year. Create your plan, make it bold and challenging and keep it current. The planning process is not a one off activity. It is continuous and evolves. Once the plan is in place it needs to be updated and modified as you make changes in your practice. Understanding your clients goes a long way to developing the best plan for better managing their bookkeeping. Completing a full situation analysis allows you to look into their business and understand their pain points. We live in a tech world but not everyone is tech savvy. Understanding your clients adoption to cloud and tech will help you to tailor your plans to suit their needs. Review and group them into clusters pertaining to their ability to adapt to technology and change. The next step is to put on your sales hat. We all must take on a sales role when running our own business. Selling in your plan is vital for success. Developing the right tools and information will make it easier and more effective when you front up to the client with your ideas. Develop your pitch and be clear about your message. The pitch is a very important part of your plan. It lays out the issue, background and benefit of what you want to improve. This pitch needs to be prepared well in advance and practiced before meeting clients. Agree what you will deliver and then measure it. Selling in your idea is the first step. You then need an action plan that will deliver. Creating clear measures allow you to monitor success and report back to your team and clients on what has been achieved. The value of the bookkeeping you provide to your clients is paramount to their success. You are a vital part of their business. It’s important to maintain this view as you roll out your plan. Helping them go paperless, changing their process, getting them organised online and saving them time changes how you interact with your clients. It doesn’t change the value of what you provide. Finally its paramount you tackle and handle objections. An area that is often confronting and tough to handle. Objections are part of our business life. We are constantly faced with objections from clients, team members and suppliers. As you automate and sell in a new way to operate, people will object. Handle objections. I look at objections as opportunities and take a positive approach. There is no point hiding from objections. Its best you tackle them head on. Brainstorm objections and understand how to solve them. Creating great case studies is powerful in supporting your pitch and showing that streamlining does work. As you convert more clients you will have more stories to share. Get underway with your practice and start sharing your story. Streamlining your practice by implementing Receipt Bank is powerful. It will save your clients time and money. It will make the way you work together more productive. No more paper or data entry are just two of the multitude of key benefits. It’s a game changer an time to act now. 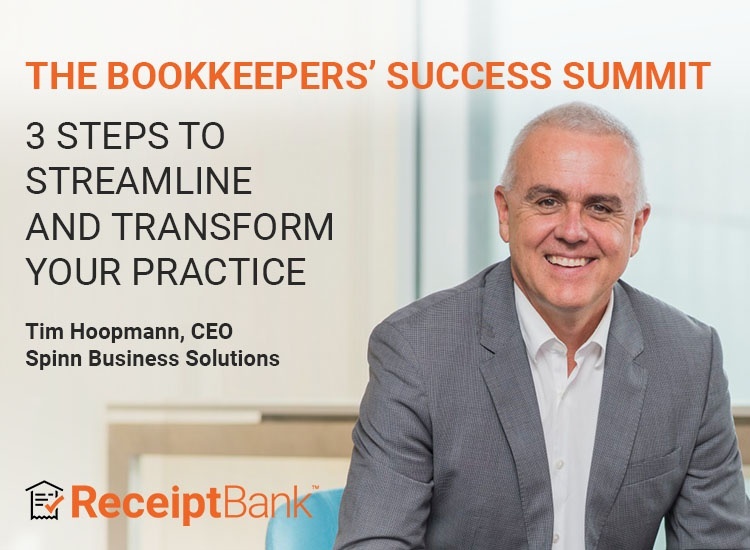 My number one message for bookkeepers is to get underway now and begin your journey to a more streamlined practice. From small things bigger things grow. Getting underway and having a go is so much better than sitting and wondering what could have been - it’s much more fun too! Challenge the norm and be adventurous. Make your practice the best it possibly can be in the coming year. Streamline and engage with your clients more effectively. Save time and money. Allow your practice to grow and prosper. Tim Hoopmann is the founder of Spinn Business Solution. He is focused on helping small business utilise the power of technology to transform their business online. Are you confused about how to move your business online? Finding it challenging choosing apps that will automate your processes? Don’t have time to implement and train your team? Not sure how can technology will help you grow your business? Spinn will answers these questions and more while automating your business to make it run effectively online. Interested in how to streamline and save time and money? Email or visit SpinnBusiness Solutions.